Sometimes you just have to do it yourself. Exercise and just the grind of everyday daily living activities can make your body sore. Muscles become sore, tight and even knotted, depending on the repetitive activities you are engaged in. Whether training for a competition or for your daily 1-hour morning walk, you can use your own hands to revive your muscles and heal injuries. Not having access to professionals is no longer a good reason to postpone your treatment. Muscles account for 60% of the human body mass. Acting fast to treat muscles knots is the best medicine in order to prevent painful discomfort and to optimize your body. You’ll be surprised. Simple. Fast. Effective. You already use your own hands for self-massage more than you realize – it’s so natural. How many times have you put your hands behind your neck and used your fingers to massage tension out of your neck (trapezius) or grabbed and massaged an injured body part. This is very natural and common. Start with the obvious. Find the painful areas. If you just worked out your legs for 2 hours in the gym/cross-fit, then a good place to start would be the leg muscles. For persistent, chronic pain you should start where you think the pain is and start the discovery there. Using the palm and fingers of both hands, use long massage stokes with light pressure along the fibers of the muscle. Start from the beginning of the muscle to the end of it. You will get immediate biofeedback from the muscle. You will either feel soreness, tightness, a knot or even sharp pain. Each signal is a different stage of discomfort in the muscle. Depending on what feels easy and comfortable to you, you can use anatomical structures such as the thumb, fingers, fist, palm and elbow to facilitate massage. This relieves the stress on hand joints through repetitive use. Finding trigger points takes practice because pain and location are not always in the same place. Within the muscle there are multiple trigger points, and they all can be sore or one could be the culprit needing treatment. It is best to isolate the one muscle and one trigger point needing attention rather than doing a shot gun approach on all of them. Doing an at-home targeted muscle recovery massage is far superior. When you feel a “knot” in the muscle or just soreness, start to press in with your thumb, then release and massage using long strokes again. Repeat until the knot/soreness is less intense. With this biofeedback you will learn what “good” pain feels like. Remember it’s the long rolling strokes of your hands that helps find the sore spots and the pressure you apply with the thumb, fingers, or elbow that causes the trigger point to dissipate. Self-massage is using precision targeting and pressure to work efficiently and effectively on muscles. When you find a trigger point in the muscle, gradually increase pressure on it with your thumbs. If the knots moves, then you might have to wiggle the thumb while on the trigger point or re-adjust, while maintaining pressure on it. Pressure hold times will vary but in general a “hold for 3-5 seconds, then release” pattern works. As you learn, you will fine tune the hold times to either be greater than or less than that depending on how sore the muscle is. Pressure on the trigger point or muscle knot should feel relieving. If you are grinding your teeth, you probably need to be gentler. For muscle recovery to be effective, it must be efficient at targeting specific muscles. Fingers are good because they can get into small areas of the muscle without putting healthy muscles out of balance. Doing deep tissue work on healthy muscles is not good. It can only cause more problems. The legs are one of the easier muscle groups to massage by hand. Because of their location you can bend, see, and angle them for easy access. Since some muscles are so big, and so much pressure is needed for a therapeutic effect, a combination technique of the hand plus the elbow works best. The deep adductor muscles of the inner thigh are so important and are usually not given much attention in professional massages. They can be accessed easily in a crossed-leg position (all of these can be performed in a chair also). In this position, the elbow is preferred to leverage the force of gravity. Start by placing your elbow in the middle of the inner thigh and slowly push forward with enough pressure to slide forward toward the calf, then come back and repeat toward the opposite direction. You will not be able to get completely into the groin region of the muscle where it attaches, but it should be close enough to target the muscle. 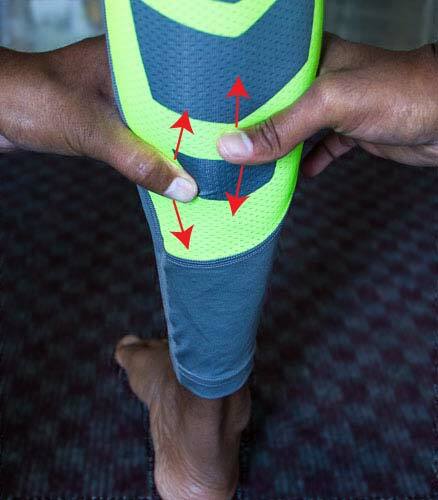 Both the left and right leg can be massaged at the same time for efficiency. Doing dual massage on opposite leg muscles is always preferred. The biofeedback it provides is a baseline of which leg is more dysfunctional. IT Band (illiotibial band) can also be massaged using the elbow. Use gravity to amplify the downward force and use long, forward motions to massage the outer thigh. Switching between forearm for massage and elbow for pressure on a sore spot is a good technique. Hamstrings are big, thick muscles and they can be accessed while sitting on the ground with the leg bent. Make sure to relax the muscle since it can be contracted and you will not notice it. You will not be as effective when the muscle is even slightly contracted. Using all fingers to press into the muscle, use a press-pinch and release technique as you propagate along the hamstring muscle. Calf muscles can be massaged using the thumbs. Press while massaging down is a good technique. At the end repeat from the top of the calf where the knee meets. Adding a twisting inward provides a good fictional feel to the muscle. Feet are important and very easy to massage using the thumbs. Using a focused pressure point to massage with short strokes toward the toes, followed by press and release back along the muscle is a nice pattern. The long-term goal of self-massage is to release muscle tension and to prevent pain and injury. If you notice reduction in pain, pat yourself for a job well done. Hand massage is a short-term solution to self-care since applying constant pressure on the thumbs can lead to saddle joint problems. Manual therapy products like the TP BuddieRx make muscle recovery easy and can complement any type of massage. The key to healing and recovering quickly is being able to identify muscle knots, treat them quickly and flush out muscle toxins such as lactic acid and other metabolic wastes after exercise. In addition, it allows your brain to know exactly where the pain/injury is and to allow the body to begin the healing process. Committing to a dedicated muscle recovery program is important to remain a life long athlete. In the end, you will find a daily self-care routine is vital if you want to live more life.